If you’re searching for a way to begin a discussion on Trust, try our powerful training tool – Trust Cards. Created to help people speak safely and easily about trust, the Trust Cards serve as an excellent icebreaker. 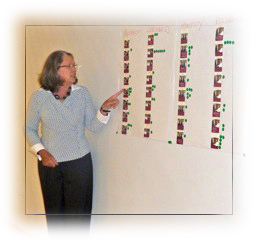 Using the set of 32 cards that itemize behaviors leading to or depleting trust, participants answer any one of several sample questions to prioritize and frame their understanding of trust. For example, pairs or teams may ask each other, “How do people win my trust?” Using the Trust Cards, each person then privately sorts through their own set of 32 cards and selects the five reasons they typically trust someone else. This hands-on task, the experience of briefly reviewing 32 behaviors, and everyone’s five choices quickly set the stage for a lively and stimulating discussion about the behaviors that evoke trust. In about 20 minutes, people learn a great deal about trust and gain insights about themselves and others. For further discussion, the Facilitator’s Guide and Participant Worksheets illustrate over 20 questions and an expansion of the trust theme so the Trust Cards may form the center of an entire workshop. Reusable and attractive, the Trust Cards offer endless practical applications. See the Trust Card Testimonials section to read about various uses with different audiences. A new and interesting approach to ensuring accelerated group dynamics on a sensitive and complex topic, Trust Card discussions show that definitions of trust are muddy and varied. The cards provide a common language for taking action to improve trust among pairs, teams, or functions. Why Are Trust Cards Important? The Trust Card activities allow for ways to speak about trust so that individuals or organizations in a dynamic business environment can open honest and clear communication channels. Use Trust Cards as an ice-breaker among newly developed pairs, existing groups, or with new team members. For FedEx two-day delivery please contact Michelle Blanchard: michelle@badergroup.com. We use USPS Priority Mail as our standard shipping method.